[185 Pages Report] The anomaly detection market size is expected to grow from USD 2.08 Billion in 2017 to USD 4.45 Billion by 2022, at a Compound Annual Growth Rate (CAGR) of 16.4%. The main objective of the report is to define, describe, and forecast the anomaly detection market size on the basis of components (solutions and services), technology, deployment type, vertical, and region. The report provides detailed information on the major factors (drivers, restraints, opportunities, and challenges) influencing the growth of the market. It attempts to forecast the market size with respect to the 5 main regions, namely, North America, Europe, Asia Pacific (APAC), Middle East and Africa (MEA), and Latin America. The report profiles the key market players and comprehensively analyzes their core competencies. It also tracks and analyzes the competitive developments, such as joint ventures, mergers and acquisitions, and new product developments, in the anomaly detection market. The anomaly detection market includes various vendors providing anomaly detection solutions, inclusive of network behavior anomaly detection and user behavior anomaly detection to commercial clients across globe. Companies such as International Business Machines Corporation (US), SAS Institute, Inc. (US), Cisco Systems, Inc. (US), Dell Technologies, Inc. (US), Hewlett Packard Enterprise Company (US), Symantec Corporation (US), Trend Micro, Inc. (Japan), Splunk, Inc. (US), Wipro Limited (India), Securonix, Inc. (US), Gurucul (US), Happiest Minds (India), and Guardian Analytics (US) have adopted partnerships, agreements, and collaborations as the key strategies to enhance their market reach. 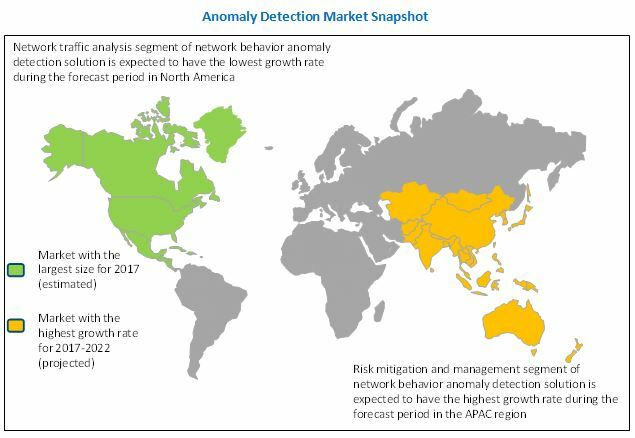 MarketsandMarkets forecasts the global anomaly detection market size to grow from USD 2.08 Billion in 2017 to USD 4.45 Billion by 2022, at a Compound Annual Growth Rate (CAGR) of 16.4%. 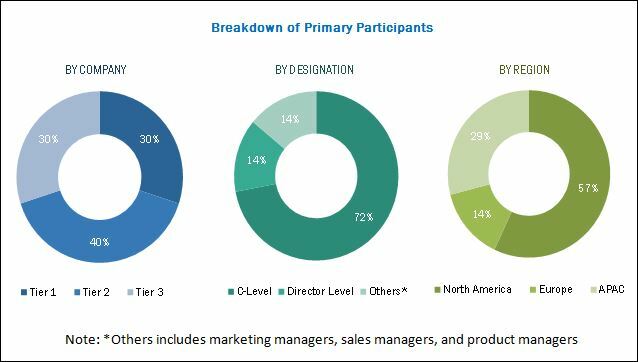 The anomaly detection market is segmented on the basis of components (solutions and services), technologies, deployment types, verticals, and regions. The solutions segment is further segmented into Network Behavior Anomaly Detection (NBAD) and User Behavior Anomaly Detection (UBAD). The NBAD solution segment is further segmented into network traffic analysis, network intelligence and security, and risk mitigation and management. The user behavior anomaly detection solution segment is further categorized into Identity and Access Management (IAM), threat intelligence and management, Data Loss Prevention (DLP), and Security Information and Event Management (SIEM). The service segment is categorized into professional and managed. The network behavior anomaly detection solution segment is expected to hold the largest market size during the forecast period, as the networking technology advances, the threat from spammers, and attackers and criminal enterprises has also grown accordingly. Additionally, the NBAD solution is used in conventional firewalls and applications for the detection of malware. The technology segment is further categorized into big data analytics, data mining and business intelligence, and machine learning and artificial intelligence. The deployment type segment is categorized into cloud, on-premises, and hybrid. The vertical segment is categorized into Banking, Financial Services, and Insurance (BFSI), retail, manufacturing, IT and telecom, defense and government, and healthcare. The anomaly detection market is witnessing a traction due to the advent in the growth of data and emergence of High-Performance Data Analytics (HPDA), and increase in cyber espionage and fraudulent activities. The NBAD solution has been instrumental in continuously monitoring a complex network to identify unusual events or trends, or anomalies. They are majorly considered as an integral part of NBAD, which provides an additional layer of security to the existing network. UBAD is based on analyzing the user or entity behavior, and analyzes patterns of human behavior, and then applies algorithms and statistical analysis to detect meaningful anomalies from those generated patterns. It can also predict when an anomalous behavior is likely to occur and identify when a user’s account has been hacked. The trending technologies, such as big data analytics, data mining and business intelligence, and machine learning and artificial intelligence, play vital roles in the anomaly detection arena. These technologies enable an enterprise to detect anomalies and reduce the risk of data loss and optimization of business processes. The emerging big data analytics-based anomaly detection solutions enable the processing of large volumes of data, learning of normal behavior of complex systems, and detection of anomalous behavior in data. These solutions continuously monitor data and help in the early detection of problems by identifying irregular behaviors. North America is expected to hold the largest market share and dominate the anomaly detection market during the forecast period. The region is witnessing trends, such as Bring Your Own Device (BYOD); increasing adoption of smart connected devices; and Industrial Internet of Everything (IIoE). North America has always topped the list for the most affected region in the world in terms of threats, intrusions, and security breaches, and as a result, it has the largest number of security vendors. Moreover, the increased budgets and grants have invited various big players to make significant investments in this region. These are some important factors driving the growth of the anomaly detection market in North America. Furthermore, the advent of Small and Medium-Sized Enterprises (SMEs) and the startup culture in North America is growing at a faster pace as compared to the other regions. Asia Pacific (APAC) has witnessed advanced and dynamic adoption of new technologies and always been a lucrative region. The region is expected to grow at the highest CAGR during the forecast period in the anomaly detection market. In addition, owing to the rapid development in IT infrastructure and the adoption of new technologies, such as big data and analytics, augmented reality, industrial Internet of Things (IoT), remote asset management, cloud, and cyber security are driving the growth of the anomaly detection market. Moreover, the increased investments in large-scale infrastructure projects by vendors in the APAC region. Competition from open-source alternatives hampering the demand for commercial solutions, and lack of skills and expertise are some of the restraining factors for the anomaly detection market. However, the recent developments, new product launches, and acquisitions undertaken by the major market players are boosting the growth of the market. The study measures and evaluates the major offerings and key strategies of the major market vendors, including International Business Machines Corporation (US), SAS Institute, Inc. (US), Cisco Systems, Inc. (US), Dell Technologies, Inc. (US), Hewlett Packard Enterprise Company (US), Symantec Corporation (US), Trend Micro, Inc. (Japan), Splunk, Inc. (US), Wipro Limited (India), Securonix, Inc. (US), Gurucul (US), Happiest Minds (India), and Guardian Analytics (US). These companies have been at the forefront in offering reliable anomaly detection solutions to commercial clients across diverse locations. *Details on Overview, Strength of Product Portfolio, Business Strategy Excellence and Recent Developments Might Not Be Captured in Case of Unlisted Companies.